Has the Truth Seized Your Heart? 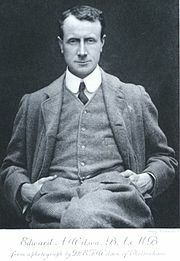 Edward Adrian Wilson (“Uncle Bill”) (1872–1912) was an English physician, polar explorer, natural historian, painter and ornithologist. Until very recently I knew very little about Edward A. Wilson other than his name and his association with naturalism and polar exploration. I came across a book with the title The Faith of Edward Wilson, by George Seaver. The title intrigued me thus I did some digging into the story of this remarkable man who died at the young age of 39. First, there is plenty on the Internet to introduce you to Wilson’s life and prodigious work if you care to explore further. Just use your search engine. There is even a website devoted entirely to Wilson at www.edwardawilson.com. It makes for very interesting reading if you have the time and interest. On this well-done Wilson site I encountered this biographical material about his college years at Cambridge. This genuinely drew my interest. Despite his popularity, in many ways Wilson cut an isolated figure. Underneath the jovial veneer, he was still a sensitive and highly strung young man. He was critical of both himself and others. He disliked hypocrisy, injustice and self-pity, no doubt struggling with these traits within himself, and he possessed a caustic tongue that could be cruel. Wilson constantly struggled to achieve mastery over himself and these faults, possessing enough humor, humility, self-depreciation and lack of confidence to avoid ever becoming pious. This deep introspection, typical, perhaps, of an undergraduate, appears to have led to a series of brooding self-portraits, something that he rarely indulged in, either before or after this time. It was during this time, too, that Wilson began to formulate the deep Christian code by which he lived his life. This was based upon a stringently ascetic reading of the New Testament. None but his intimate friends ever realized that it was this deeper spiritual level that gave Wilson the moral power they so respected, as he rarely talked of such things, yet it gave him the inner strength and ascetic self-discipline upon which his future life would depend. Wilson came to care little for originality and greatly for Truth, whether scientific, moral, artistic, spiritual or physical. Every aspect of life became, for him, a part of an indivisible Divine Truth with science, art and poetry simply different ways of explaining and experiencing a complex but Divine creation. Wilson traveled with Scott on his last expedition to the Antarctic as a doctor and zoologist. He also endured a terrible winter there and in January of 1912, just weeks before he died in March, he kept a diary. In this diary are the following thoughts, thoughts which profoundly move me to the depth of my being. The more we try the clearer becomes our insight, and the more we use out thinking faculties the quicker they become in their power of grasping points of truth. Truths are not things we can pick up without taking trouble to hunt for them. And when we find a truth we really possess it, because it is bound to our heart by the process by which we reached it . . . through trouble, difficult or sorrow . . . a man binds it into his life. But what is easily come by is easily lost. Ever bit of truth that comes into a man’s heart burns in him and forces its way out, either in his actions or in his words. Truth is like a lighted lamp in that it cannot be hidden away in darkness because it carries its own light. Does the truth seize you and burn in your heart? Is Christ, who is the living and eternal truth, compel you to believe and act? If a truth, the truth, grasps your heart because you were seized by it through great trouble then you will never let go of it regardless of what anyone says about you or to you. It is this experience of the living truth that is so missing in so many Christians who profess the truth. Christopher Claud liked this on Facebook.